Encore Event Group has already experienced a month into the year, can you believe it? In a couple more months, the weather will start to get warm again. It really gets me all warm and fuzzy inside to think about all the guests we will meet and have the pleasure of celebrating with. Our team takes wedding receptions seriously, this means that we are privileged to cater to your and your family on your special day. Since wedding season is right around the corner, we are getting ready for the busy year. No 2 weddings are the same and this makes your unique. It also makes it a challenge for us to step up to plate and deliver results. Because let’s admit it, you have high expectations and only want the best. Seeing the satisfaction on the client’s face after the event is what makes it all worth it. Personally, I like high fives, but hugs and handshakes will suffice : ) And to top it all off, we like to take a photo with you afterwards in a crazy pose. It’s a great way to remember the night for both you and us! If you take a gander around our site you will see TONs of photos with us and clients. We would love to have you become a client and strike a pose with you. We are getting dozens of inquires daily for popular dates. Have you booked with your Michigan wedding professionals yet? A majority of Saturdays in busy months book up fast. It is a good rule of thumb to reserve your banquet hall a year to a year and a half before your big day. 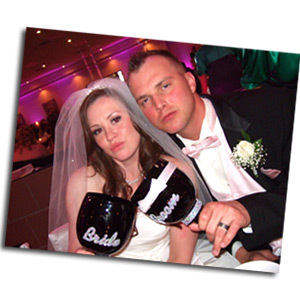 Since you already have the venue reserved, chances are you now searching a wedding DJ in Michigan. If you have questions we recommend that you browse through our website to get helpful advice. Besides reviews and photos, we also have talent bios and videos for you to checkout. We try to make our website informative enough for you to make a decision. We make it easy for you to get to know us, especially if you are planning your reception from out of state. Feel free to visit our honest references before “Checking Your Wedding Date” on the right. You can also call us toll free @ 877.643.6438, we would love to chat more about your wedding reception!